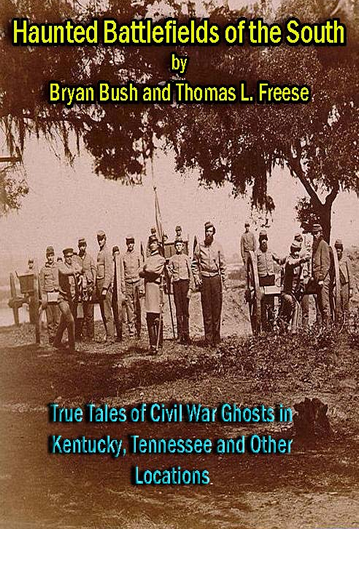 Civil War historian Bryan Bush and ghost author Thomas Freese offer both the historical background to over a dozen Civil War battles and the strange stories connected with those sites. Both authors interviewed visitors and re-enactors who had amazing, first-hand experiences with the ghostly soldiers of the War Between the States. Troop movements and battles are reviewed, including: Perryville, KY, Stones River, TN, Shiloh, TN, Andersonville Prison, GA, Sacramento, KY, Bardstown, KY, Camp Boone and Franklin, TN, Vicksburg Campaign, MS and Fort Pillow, TN. In addition the authors offer reports on haunting at other locales including historic homes, bed and breakfast establishments and cemeteries. The restless spirits of soldiers struck down in battle continue to move through our dimension. One re-enactor woke up to find a Confederate soldier calling him to the line. A woman wandered away from her tour group at the Carter House (TN) and when upstairs saw a vision from the past of doctors operating on wounded soldiers. Phantom armies are heard marching at night and the ghost battle fog rises up from a sinkhole at Perryville.